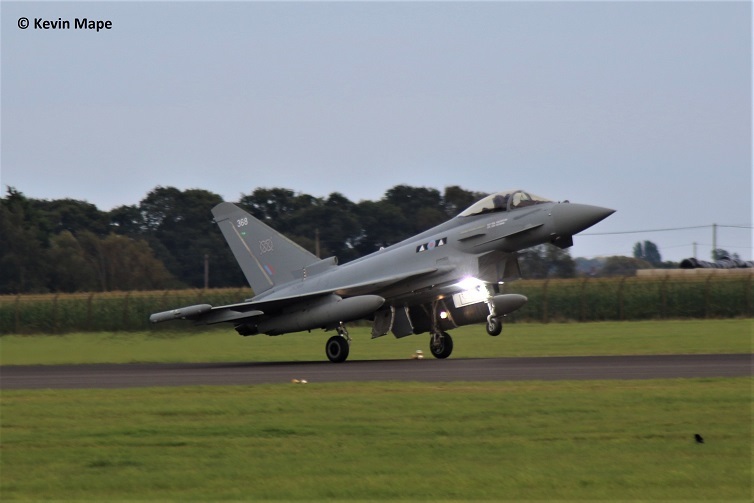 RAF Coningsby September 2017 movements. 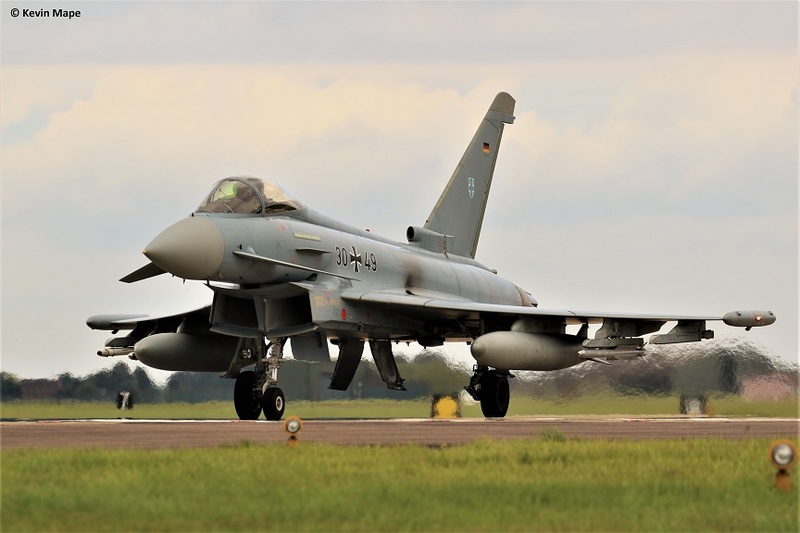 This month will see the second deployment to Coningsby of six Luftwaffe EF 200o Eurofighter, They will be joined at Coningsby by six Luftwaffe Tornado ECR and one Marham based Tornado GR4. 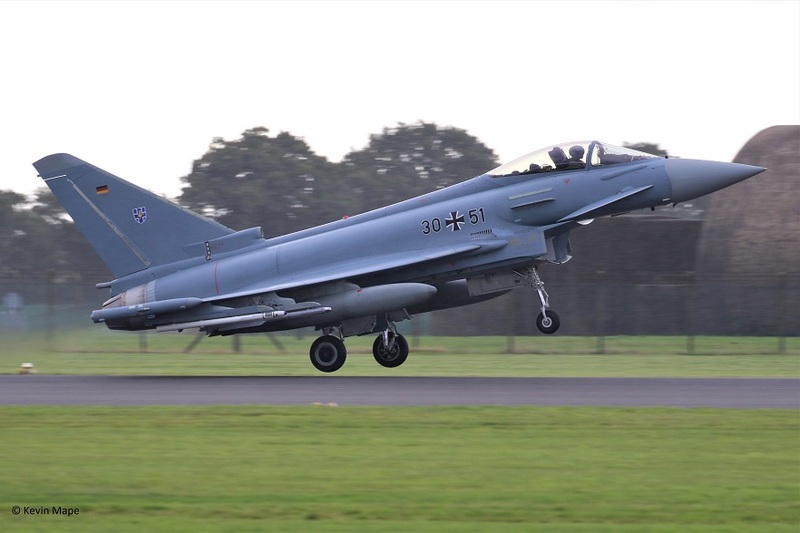 This deployment is for exercise “Cobra Warrior” that will run for three weeks at Coningsby. I think this is going to be a busy month ! ZK309 /QO-P code only – Noted on the Wash pan. XX318/318 code only /Hawk T1A c/s “Aggressor 1” – Departed. 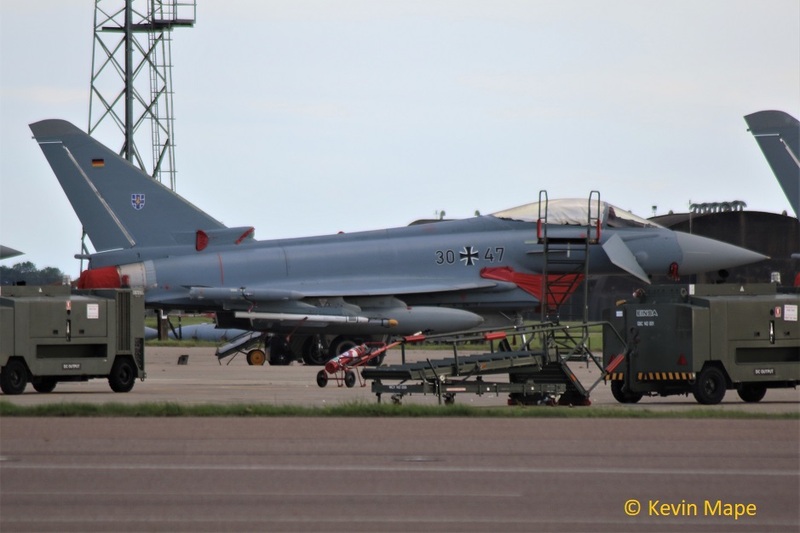 XX200/CO/100Sqn/Hawk T1A c/s “Aggressor 2” – Departed. 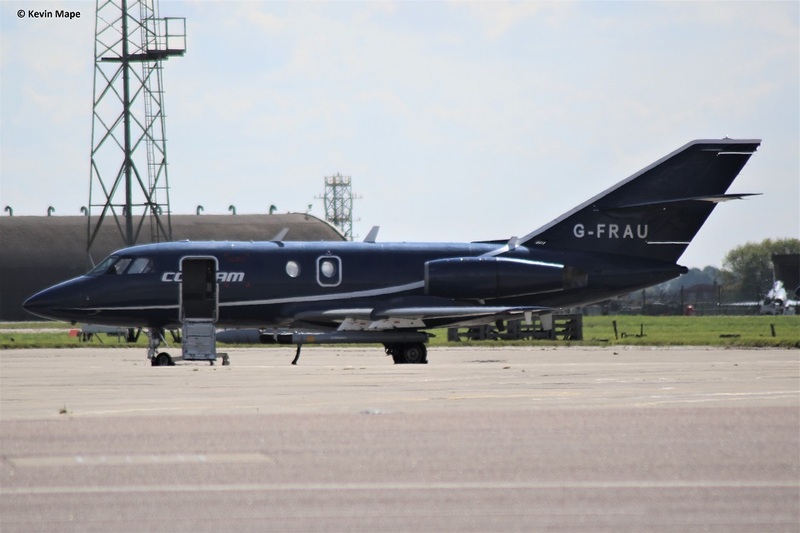 G-FRAU/AU/Cobham/Falcon 20EW c/s “Rushton 76” – Departed. 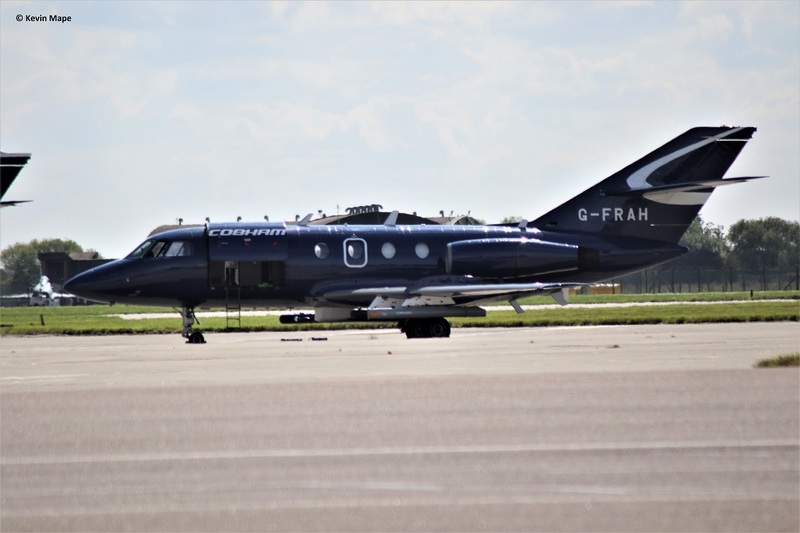 G-FRAH/AH/Cobham/Falcon 20EW c/s “Rushton 71” – Departed. PS915/BBMF/Spitfire PR XIXe c/s “Spitfire 9*” – display. 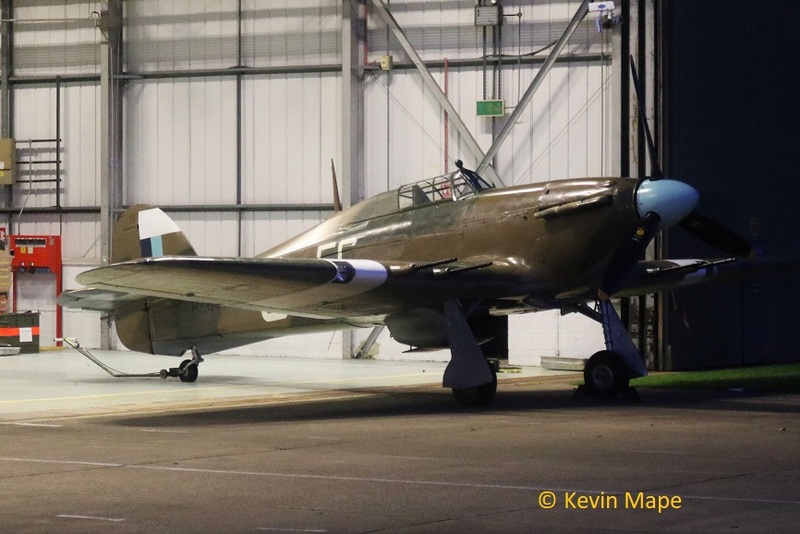 PS915 / BBMF /Spitfire PR XIXe c/s “Spitfire 9*” – Return from Scotland. G-MAJD/JD/Eastern/Jetstream c/s East Flt c/s “104” in “105” out. 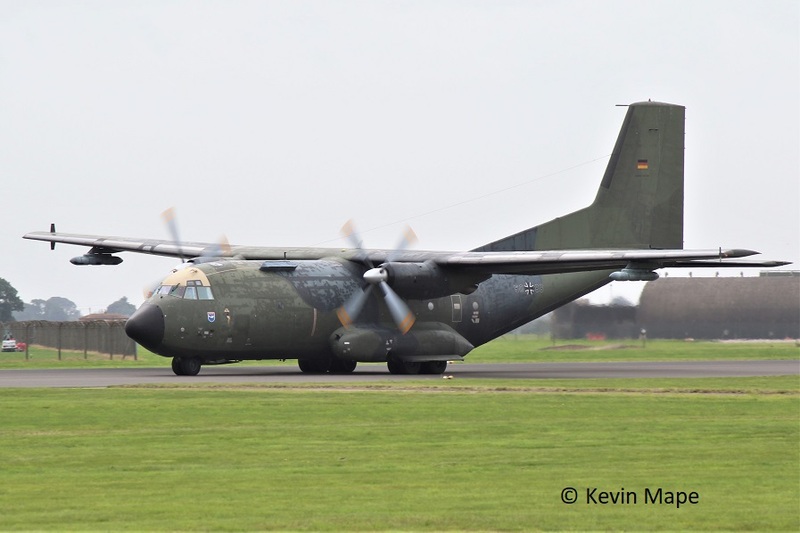 51+05/LTG 63/C-160D Transall c/s “German Air Force 261” – Parked on the ASP – now departed. 5th Tue Log thanks to Steve & Val. G-MAJD/JD/Eastern/Jetstream 41 c/s “East Flt 102” in “103” – out. ZK331/331 code only c/s “Ascot 9712” – To Cyprus. ZK302/302 code only c/s “Ascot 9713” – Ground abort. ZJ939/939 code only – Noted on the Wash pan. 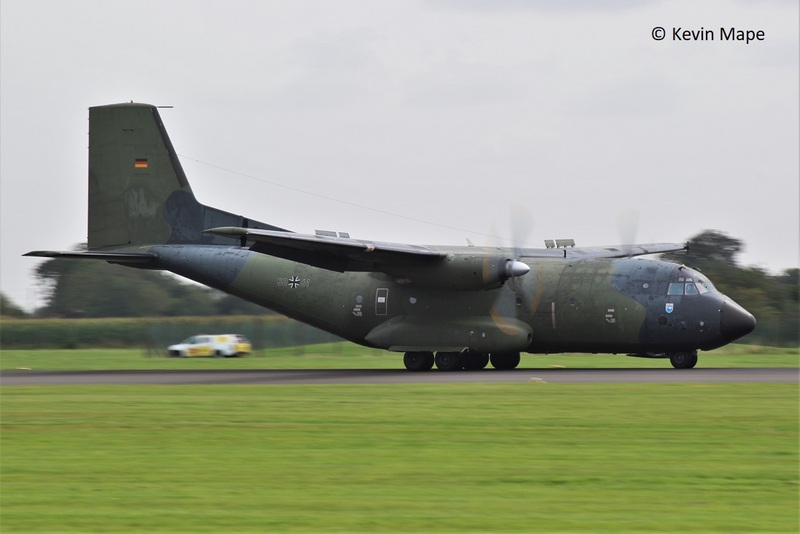 51+05/LTG63/C-160D Transall c/s “German Air Force 261” – Departed. 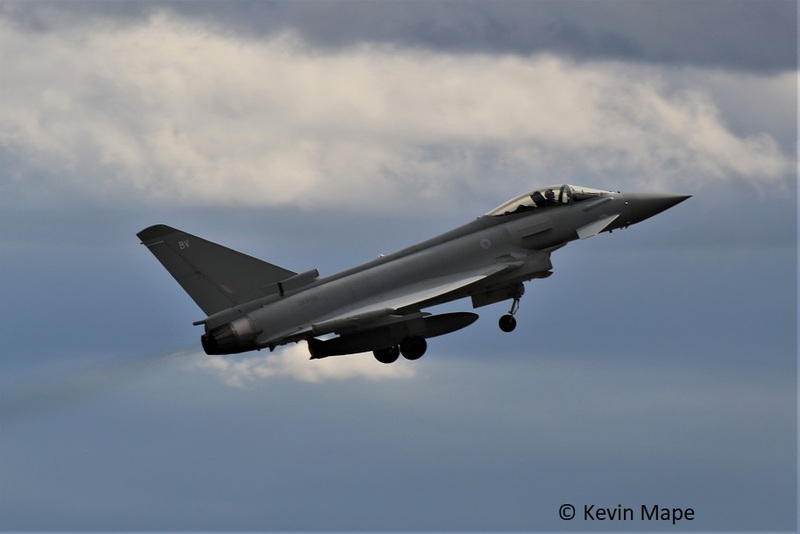 ZJ929/929 code only – QRA radio check. G-MAJD/JD/Eastern/Jetstream 41Â c/s “East Flt 104” in “105” – out. ZJ939/939 code only – Towed from Wash pan to HAS 57 in Foxtrot. 6th Wed Log thanks to Susie & Rob W.
08-00851/8SOS/CV-22B Osprey c/s “Knife 71” – high overfly. ZK379/379/41(R)TES c/s “Rebel 59”- PD at Linton. 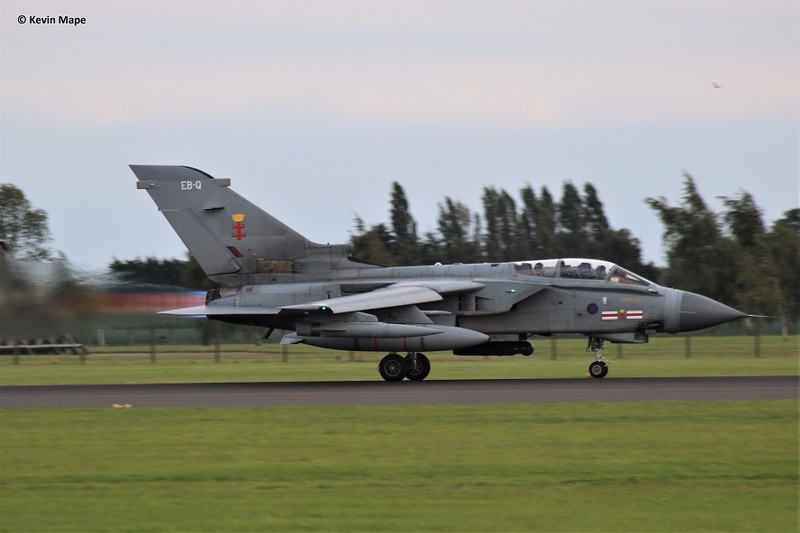 ZD719/081 code only Tornado GR4 c/s “Marham 69” – Parked on the ASP. ZJ198/4Reg/Apache AH1 c/s “Machete 22” – Fuel stop on Sierra. ZA682/Odiham wing/Chinook HC4 c/s “Vortex 566” – Parked on Sierra. 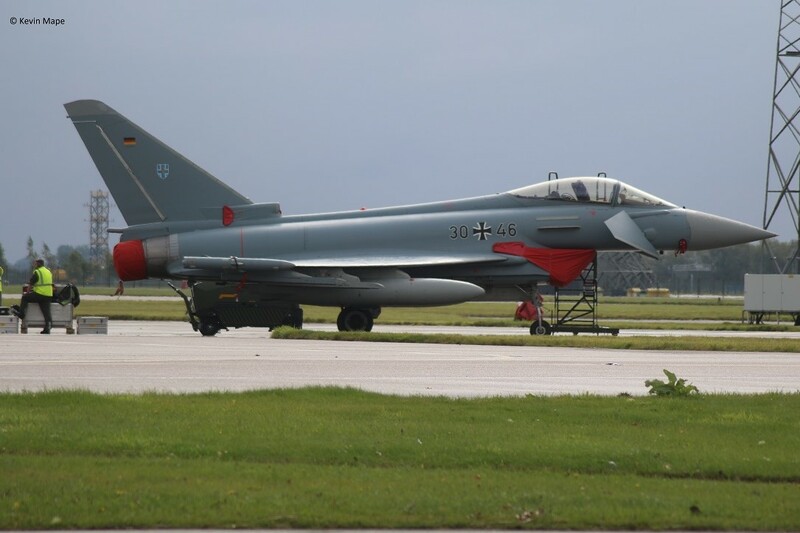 29(R)Sqn – 930, 380, 924, 812. BV. 807., 810, 920, FY, DZ. 7th Thur Log thanks to Rob W.
ZK354/BY code only c/s “Rafair 7005” . XX325/RAFAT/Hawk T1 c/s “Red 10” – Overshoot & departed. 50+74/LTG 63/C-160D Transall c/s “GAF 168” – Parked on the ASP. 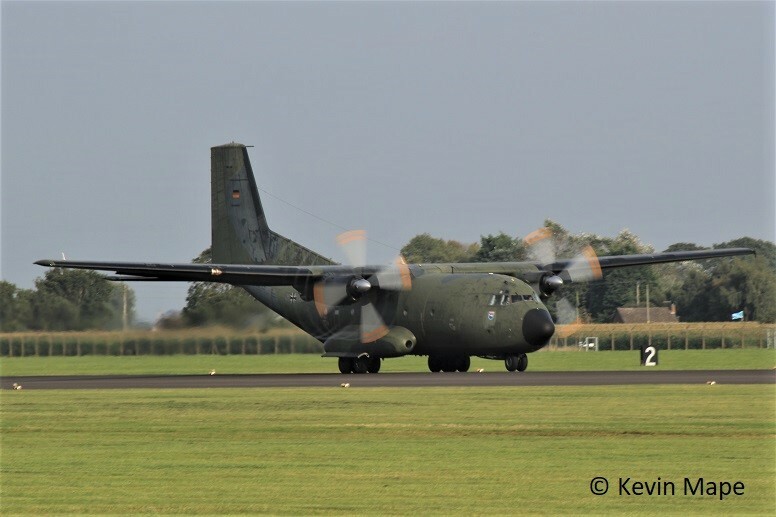 50+74/LTG 63/C-160D Transall c/s “GAF 168” – departed. 50+61/LTG 63/C-160D Transall c/s “GAF 088” – Parked on the ASP. 50+88/LTG 63/C-160D Transall c/s “GAF 164” – departed. 50+61/LTG 63/C-160D Transall c/s “GAF 088” – departed. ZJ221/4 Reg/Apache AH1 c/s “AAC 401” – Parked on Sierra. ZK330/330 code only c/s “Ascot 9722” – To Echo. 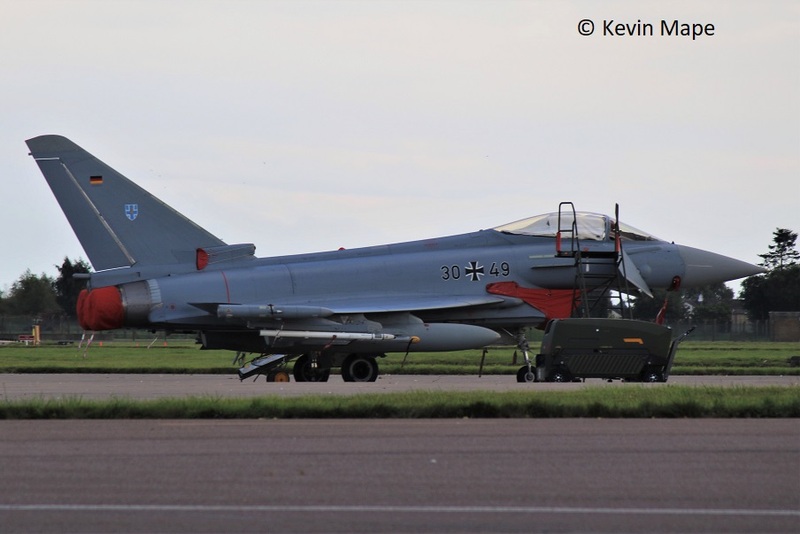 Luftwaffe arrivals for exercise “Cobra warrior” (in order of landing). ZK315/41Sqn special c/s ” Rebel 61″ – To Scampton show . ZK343/Unmarked – Engine runs on the ASP. 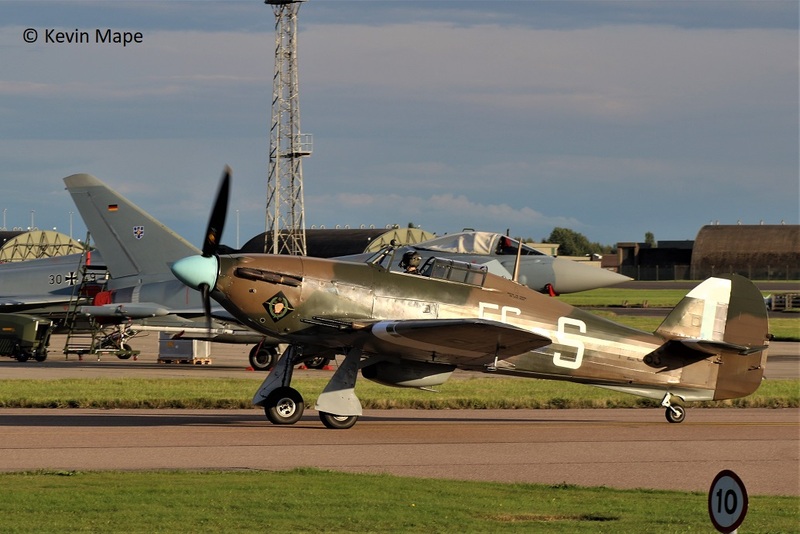 P7350/BBMF/Spitfire IIa – Engine runs. PA474/BBMF/Lancaster BI – Engine runs. PZ865/EG-S/BBMF/Hurricane IIc – Engine runs. PA474/BBMF/Lancaster BI c/s “Lancaster 95” – Flight test. 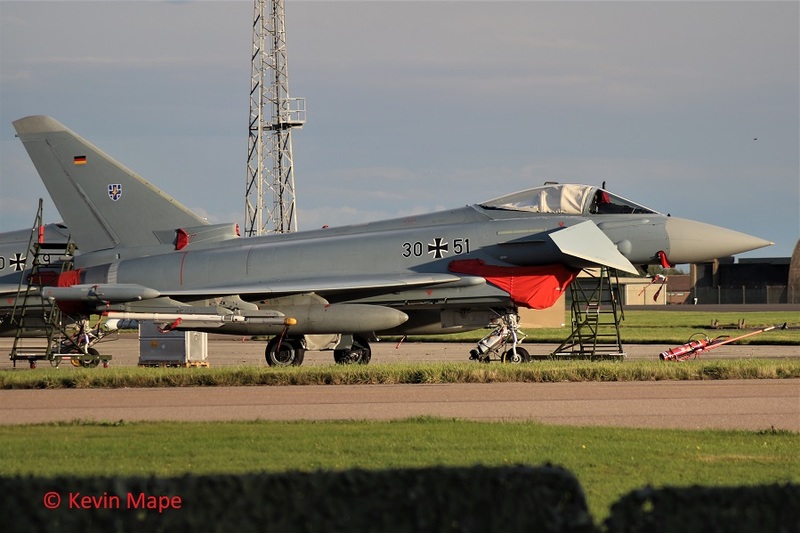 ZK352/BV code only c/s “Typhoon 45” – Scampton & returned. Tornado ECR – TLG 51 – 44+21, 45+59 ,46 +46, 46+51, 46+57. EF-2000 – TLG 73 – 30+45, 30+47, 30+49, 30+51, 30+62, 31+20. 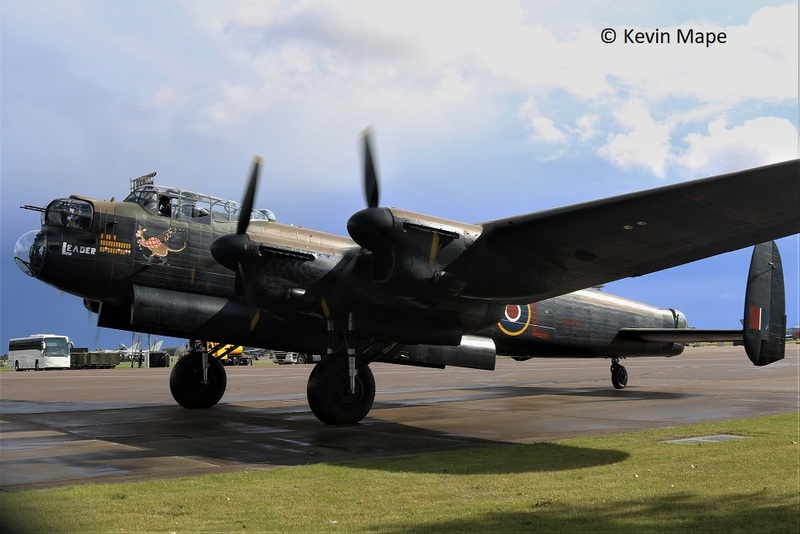 PA474/BBMF/Lancaster BI c/s “Laancaster 95” – Test flight. 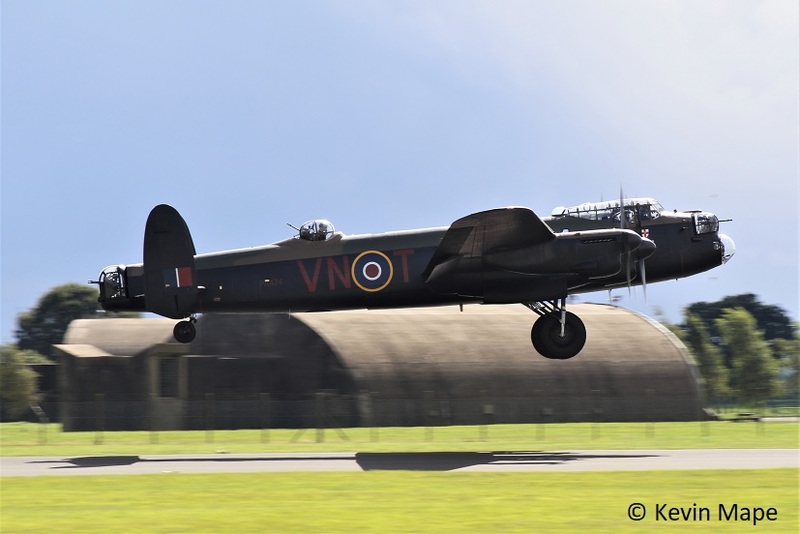 PA474/BBMF/Lancaster BI c/s “Lancaster 99” – Test flight. 11th Mon Log thanks to Susie. Noted on tow ZJ939 /939 code only to Foxtrot. ZK315/41sq 100yr Special c/s “Rebel 61” Return from Scampton. “Deluge 63” – Ground abort. ZJ810/810/29(R)Sqn c/s “Rafair 7005” – Return from Belgium. G-MAJD/JD/Eastern/Jetstream 41 c/s “East flt 101” in “102” – out. 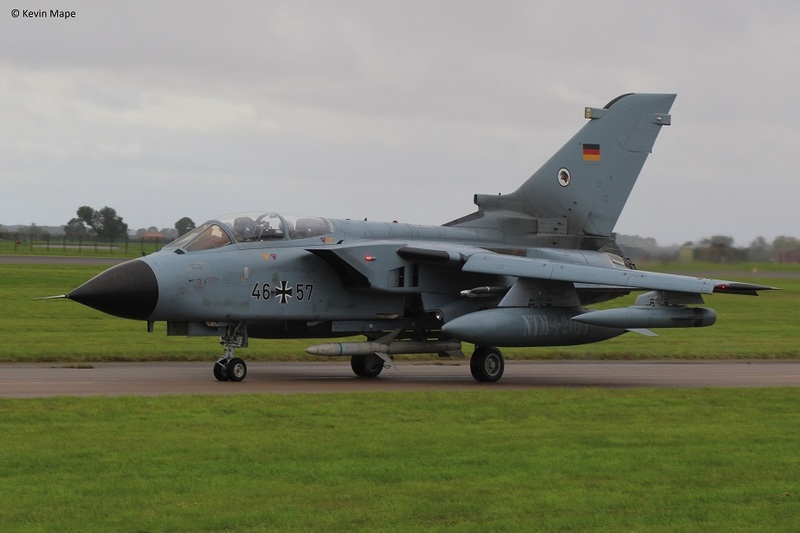 46+45/TLG 51/Tornado ECR c/s “German Air Force M 53”- New arrival to replace 44 + 21 . ZJ199/3Reg/Apache AH1 c/s “Army Air 311” – Overfly. XX284/CN/100Sqn/Hawk T1A c/s “Pirate 20” – Parked on Sierra. ZM308/3FTS/Prentis T1 c/s “Barkston 401” – Overfly. P7350/BBMF/Spitfire IIa c/s “Spitfire 90” – Air Test. G-MAJD/JD/Eastern/Jetstream 41 c/s “East Flt 103” in “104” – out. 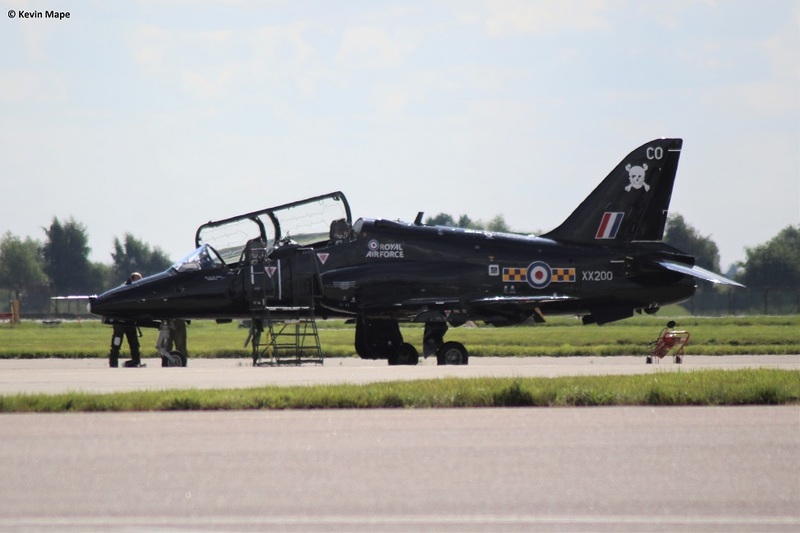 XX284/CN/100Sqn/Hawk T1A c/s “Pirate 20” – Departed. 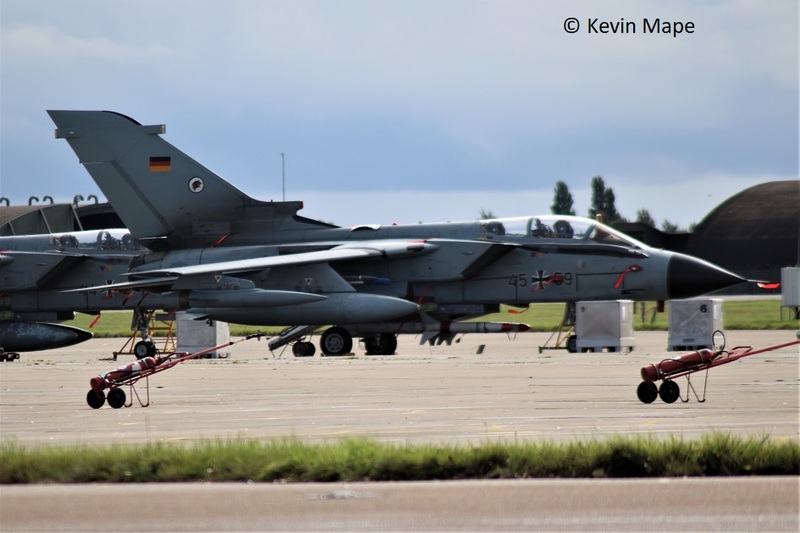 45+61/TLG 51/Tornado ECR c/s “German Air Force M 53” – Departed for home. 13th Wed Log thanks to Susie. ZE707/32(TR)Sqn/ BAe 146 C3 c/s “Northolt 20” – Parked on Sierra. 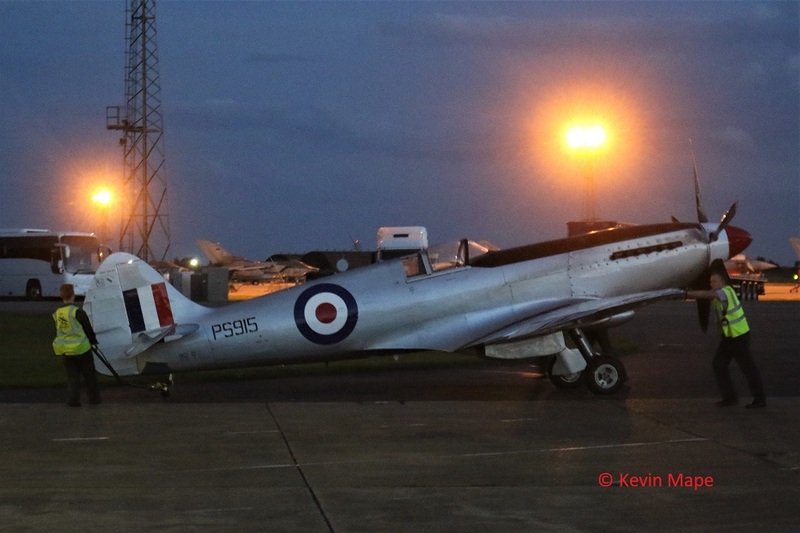 P7350/BBMF/Spitfire IIa – Noted outside BBMF. ZJ912/DR/XI(F)Sqn c/s “Warlord 11” – Ground abort. 91 310/LN/48FW/F-15E c/s “Harley 81” – Overshoot. G-BYVO/3FTS/Tutor T1 c/s “Cranwell 42” – Roller. ZK311/N code only – towed from South to North side. 15th Fri Log thanks to Susie & Luke Webster. ZK339/EB-E/41(R)TES – Noted on the Wash pan. 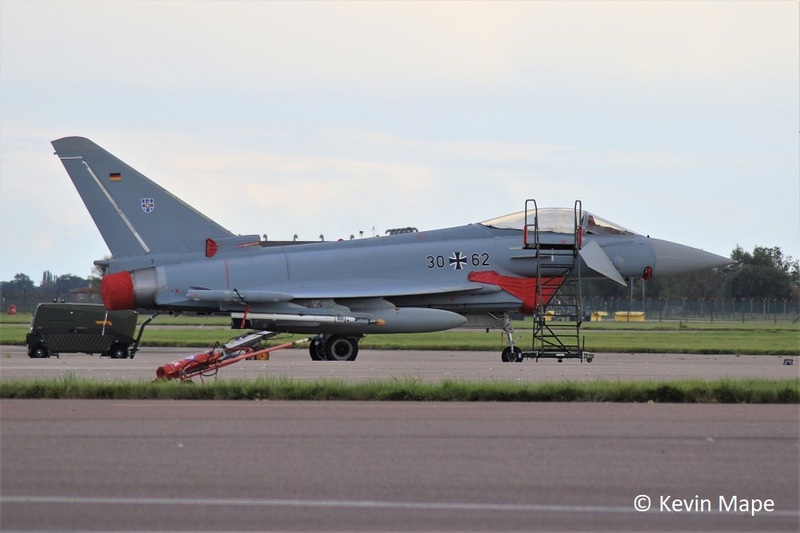 30+46/TLG 73/EF-2000 c/s “GAF S 09” – New arrival from Germany. 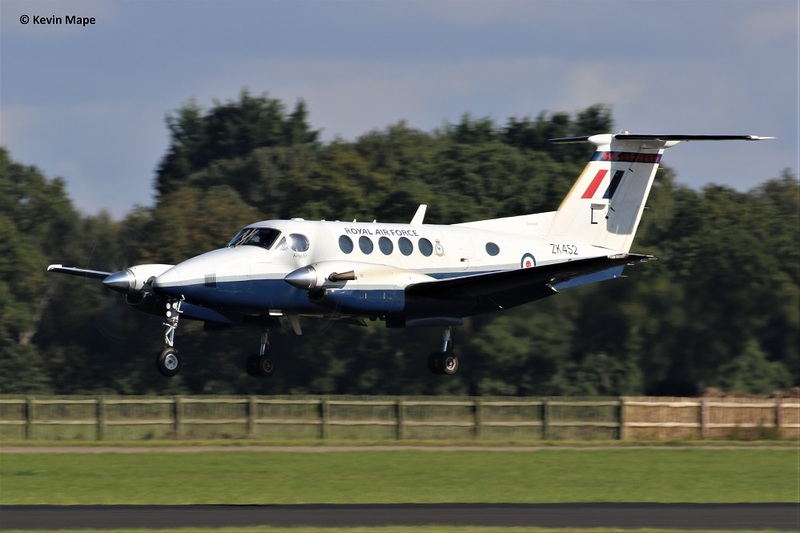 ZK455/45(R)Sqn/Kingair B200 c/s “Cranwell 63” – Roller. 18th Mon Log thanks to Susie & Rich. ZK344/344 code only c/s “Lossie 38” – Parked on the ASP. ZJ812/812/29(R)Sqn c/s “Warlord 31” – Ground abort. G-MAJD/Eastern/Jetstream 41 c/s “East flt 103” in “104” – out. ZJ924/924 code only c/s “Rebel 59” – To Lakenheath. 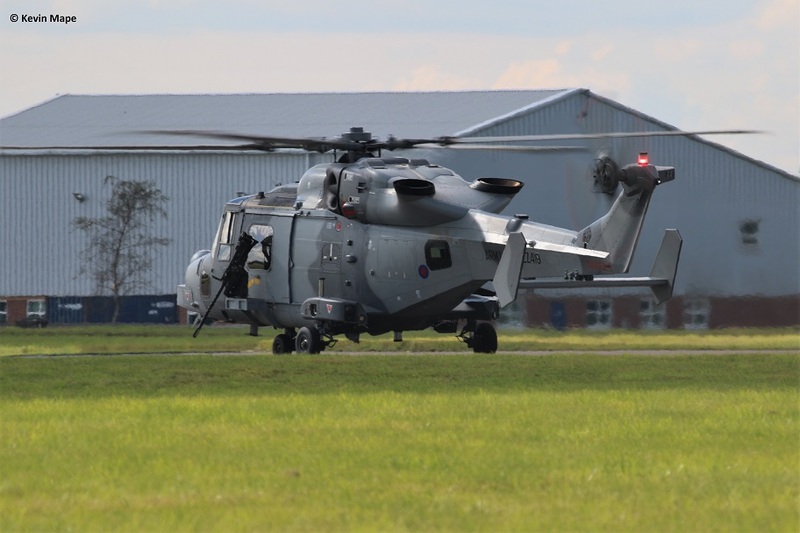 ZZ410/847Sqn/Wildcat AH1 c/s “Marine 14” – Parked on Sierra – Fuel stop – To Donna Nook. G-MAJD/JD/Eastern/Jetstream 41 c/s “East flight 102” – Ground abort – steering problem. G-FFRA/Cobham/Falcon 20EW c/s “Zodiac 51” – Parked on the ASP. G-MAJG/JG/Eastern/Jetstream 41 c/s “East flt 021 Papa” in “021P” – out. ZZ410/847Sqn/Wildcat AH1 c/s “Marine 14” – Parked on Sierra – Fuel stop the departed. 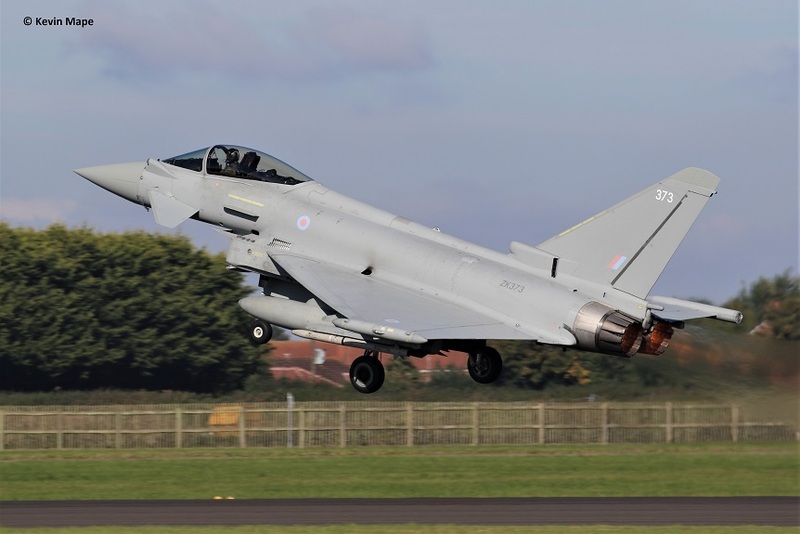 ZJ930/930 code only c/s “Typhoon 319” – PD at Linton. ZZ404/847Sqn/Wildcat AH1 c/s “Siren 05” – Parked on Sierra – Fuel stop and departed. 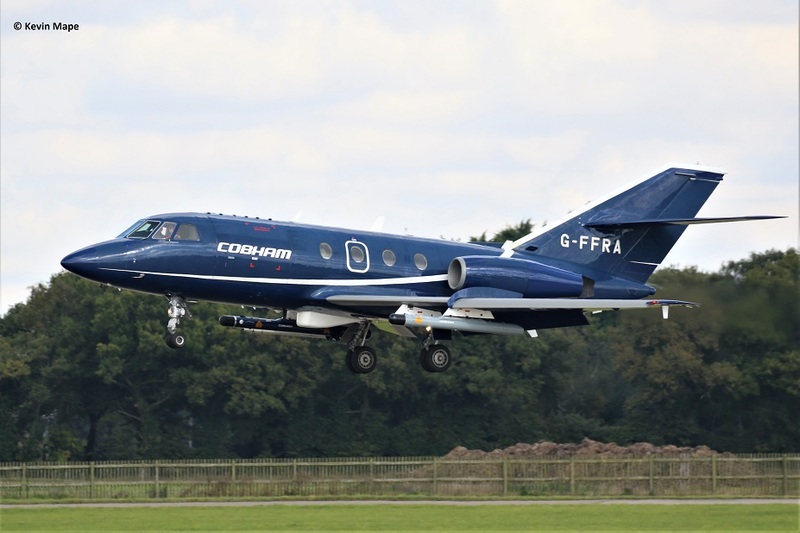 G-FFRA/Cobham/Falcon 20EW c/s “Zodiac 51” – Mission & returned. ZJ924/924 code only c/s “Rebel 59” – Returned from Lakenheath. G-MAJL/JL/Eastern/Jetstream 41 c/s “East Flt “022P” in “104” Out. 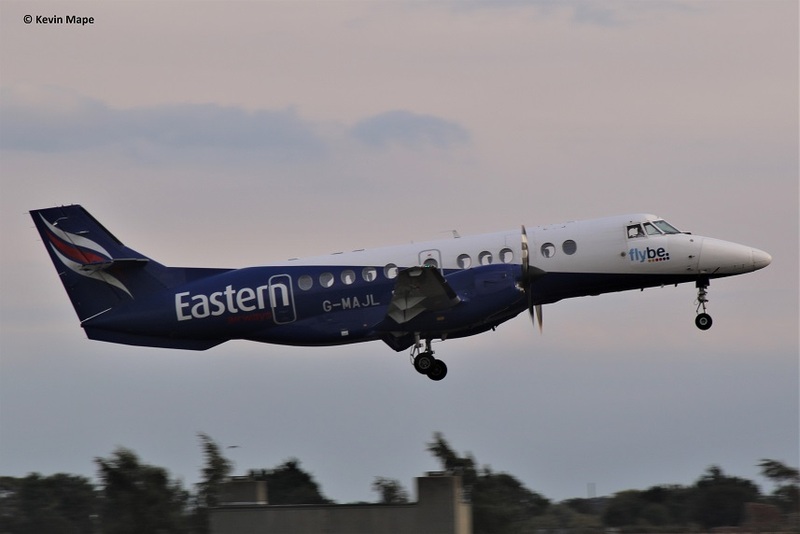 G-MAJD/JD/Eastern/Jetstream 41 c/s “East Flt 024P” – To Humberside. 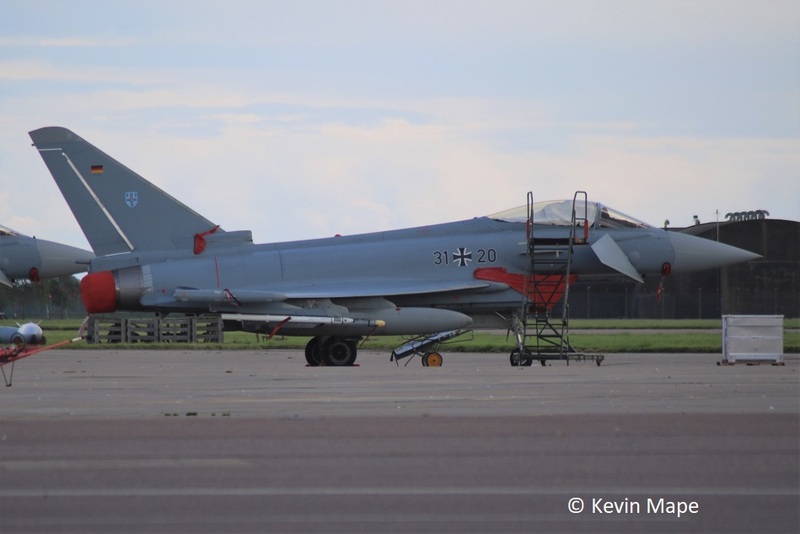 30+46/TLG 73 / EF-2000 – Towed onto the ASP – 7 German EF-2000 on the ASP. G-MAJL/JL/Eastern/Jetstream 41 c/s “East flt 101” in “102” – out. 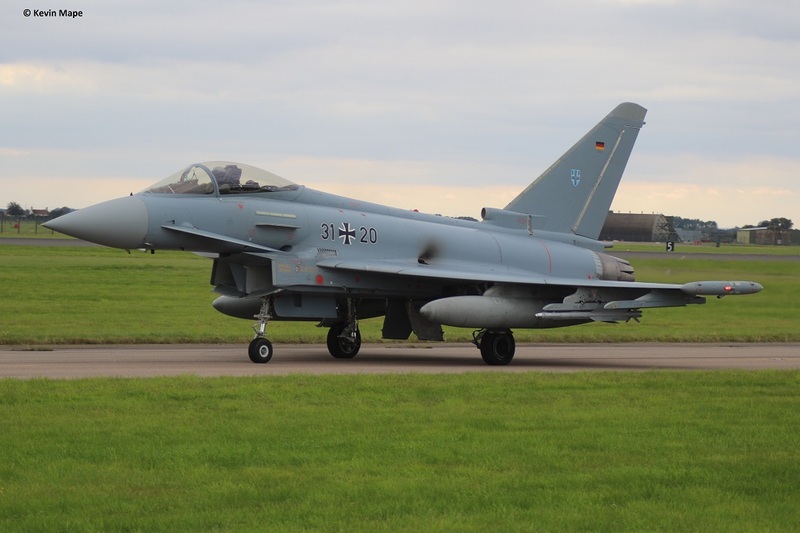 30+46 / TLG 73 /EF-2000 c/s “GAF S 09” – Returned to Germany. G-FFRA/Cobham/Falcon 20EW c/s “Barley 24” – Mission. 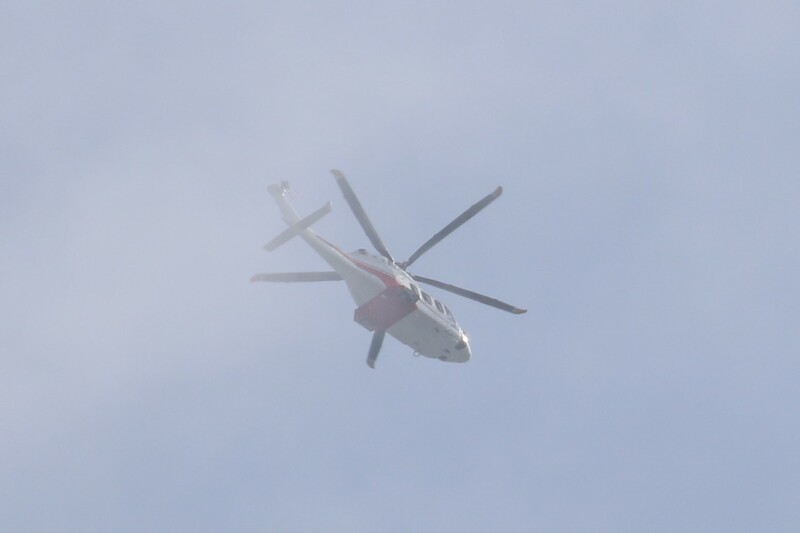 M-SHRM/AW-139 c/s “MSHRM” – Overfly. 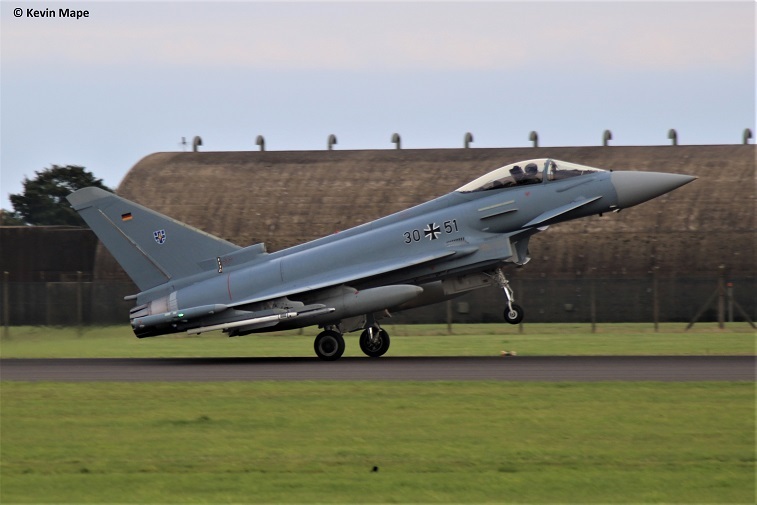 ZJ810/810/29(R)Sqn c/s “Typhoon 38” – Ground abort. ZK304/FM code only “Chaos 34” – Ground abort back to Foxtrot. G-MAJL/JL/Eastern/Jetstream 41 c/s “East flt 103” in “104” – out. 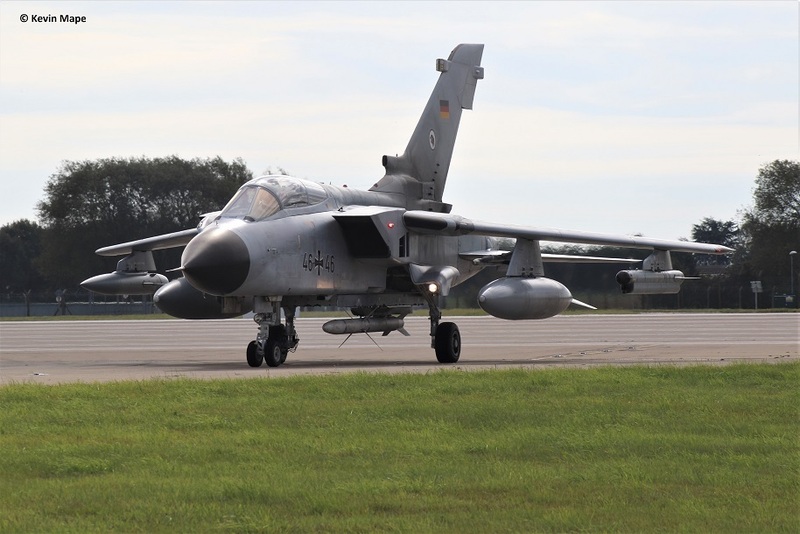 45+39/TLG 51/Tornado ECR c/s “GAF M51” – Returned to Germany. G-MAJL/JL/Eastern/Jetstream 41 c/s “East flight 101” in “102” – out. 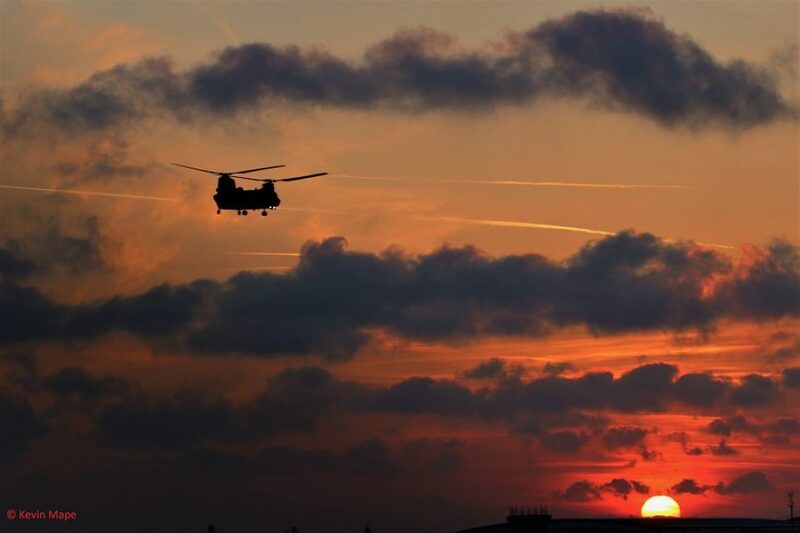 Deployment – To “Magic Carpet. In the order they departed. ZK308 : 308 code only (Lossiemouth based). All four came out of Foxtrot and departed on 07. 25th Mon Log thanks to Susie. ZK365/EB-L/41(R)TES – Noted on Wash pan. ZK378/Unmarked – Noted on tow to foxtrot. 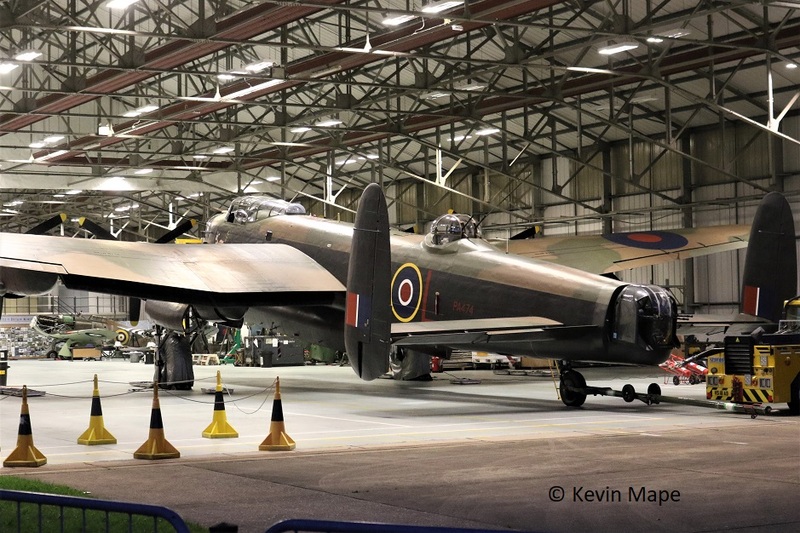 PA474/BBMF/Lancaster B1 – engine run. ZA607/EB-X/41(R)TES c/s “Rebel 87”- Low pass with burners. G-MCGE/Coast Guard/S-92A c/s “Coastguard 912” – Parked on Sierra Fuel stop. ZZ389/847Sqn/Wildcat AH1 c/s “Marine 14” parked Sierra. 26th Tue Day log thankls to Steve & Val. ZK347/347 code only – Noted on the Wash pan – later towed to southside. ZJ815 Typhoon T3 fuselage – Dumped outside HAS 59. G-MAJJ/JJ/Eastern/Jetstream 41Â c/s “East Flt 103” in “104” – out. Nights – Log thanks to Garf. N885B/ Falcon 900EX c/s “N885B” – Parked on Sierra – BAe charter. G-EGVO/Falcon 900EX c/s “GEGVO” – Parked on Sierra – BAe charter. 51+05/LTG 63/C-160D Transall c/s “GAF 208” – Parked on the ASP – night stopping. 51+05/LTG 63/C-160D Transall – parked on the ASP (Night stop). 50+76/LTG 63/C-160D Transall c/s “GAF 209” – Parked next to 51+05 on the ASP. 51+05/LTG 63/C-160D Transall c/s “GAF 208” – Departed. 50+76/LTG 63/C-160D c/s “GAF 209” – Departed. G-FFRA/RA/Cobham/Falcon 20EW c/s “Rushton 90” – Departed. EF-2000’S returned for a 4 ship low pass. Both returned for a low pass. What a great Exercise, look forward to next year. G-MERF / Grob G115A – parked at the far end of the ASP. ZJ815/ Typhoon T3 fuselage – noted dumped outside HAS 59 . Typhoon 29 – 55 , Typhoon 100 +,Typhoon 300 +. 3(F)Sqn : Call signs include – Chaos , Nightmare , Rampage , Zenith. Typhoon 2 – 10 & Typhoon 12 – 27. 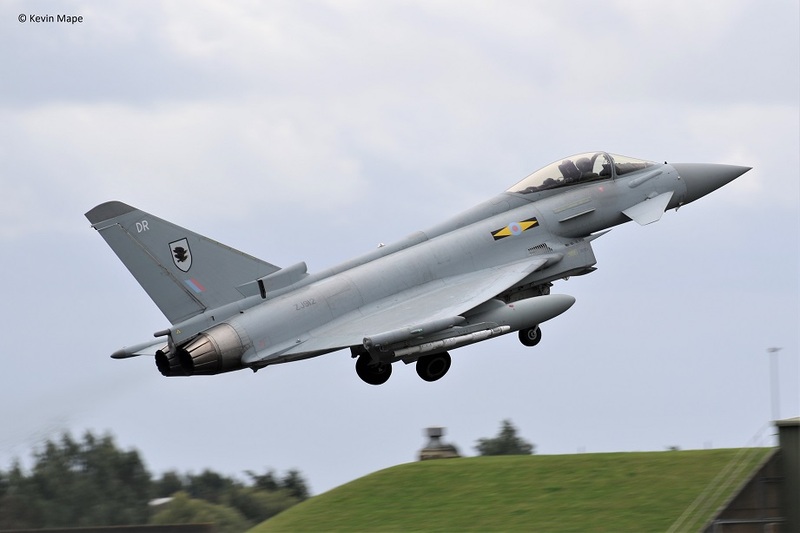 Typhoon T3 :- ZJ802 : DW. 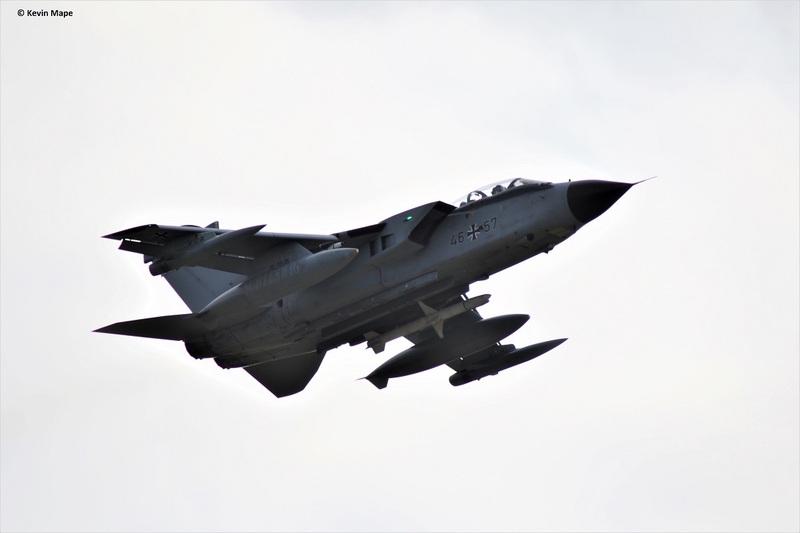 XI(F)Sqn : Call signs include – Havoc , Razor , Tyrant . Typhoon 11 , Typhoon 60 – 82. Typhoon T3 :- ZK380 : 380. 41(R)TES : Call signs include – Rebel , Apollo , Viking , Adnam. 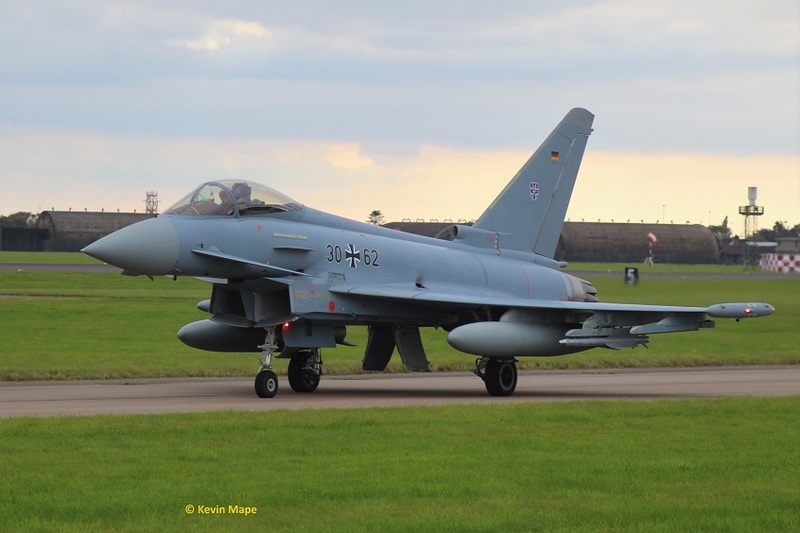 Typhoon FGR4 :-ZK315 : Sp,ZK335 : 335,ZK339 : EB-E,ZK365 : EB-L,ZK367 : EB-R.
Typhoon T3 :- ZK379 : 379. Spitfire PR XIXe :- PS915. Noted with TMF this month have included. ZJ813 : BL : 29(R)Sqn : WFU – Inst Airframe in 29(R)Sqn Hangar – Noted 27/6/17 still in Hangar 1. ZJ946 : All black : – Noted towed to the Southside for engine runs. 10/8/17. ZK332 : EB-J : code only : Towed out of paint shop as 332 /code only 18/8/17. ZJ808 : BP : 29(R)Sqn. Sustainment – Stored in Shelters in Foxtrot on the South side. ZJ944 : Unmarked : Stored damaged. CAT 3 Awaiting repair.- HAS 56. 30th Aug – 50+40 : LTG 61 c/s “GAF 104”. 4th Sept – 51+05 : LTG 63 c/s “GAF 261”. 5th Sept – 51+05 : LTG 63 c/s “GAF 261”. 50+61 : LTG 63 c/s “GAF 088”. 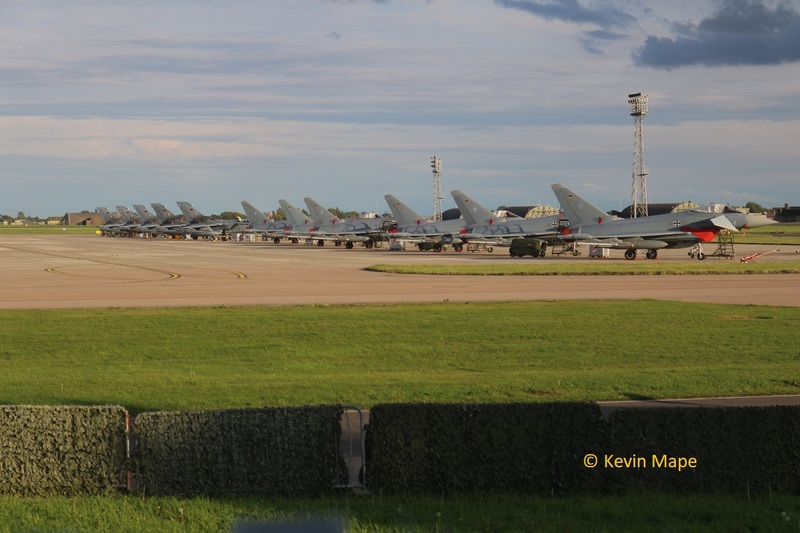 6th Sept – ZD710 : 081 code only c/s “Marham 69” Towed into 41(R)TES hangar. 45+59 : TLG 51 c/s “GAF M 53”. 46+57 : TLG 51 c/s “GAF M 54”. 12th Sept – 46+45 : TLG 51 c/s “GAF M 53” – replaced 44+21. 8th Sept – 31+20 : TLG 73 c/s “GAF S 06A”. All parked on the ASP. 30+62 : TLG 73 c/s “GAF S 06B”. 30+45 : TLG 73 c/s “GAF S 069C”. 30+47 : TLG 73 c/s “GAF S 06D”. 30+49 : TLG 73 c/s “GAF S 07A”. 30+51 : TLG 73 c/s “GAF S 07B”. 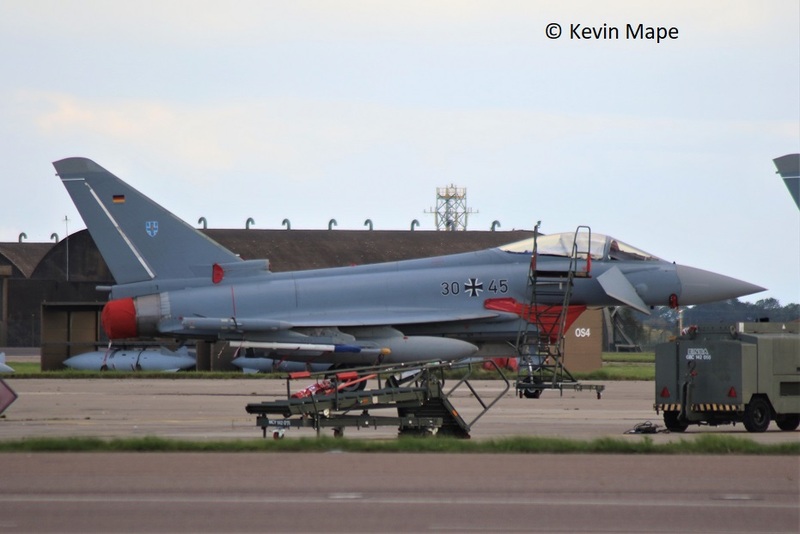 15th Sept – 30+46 : TLG 73 c/s “GAF S 08” – Arrived. 46+45/TLG51/Tornado ECR c/s “GAF M 53” – New arrival to replace 45+61. 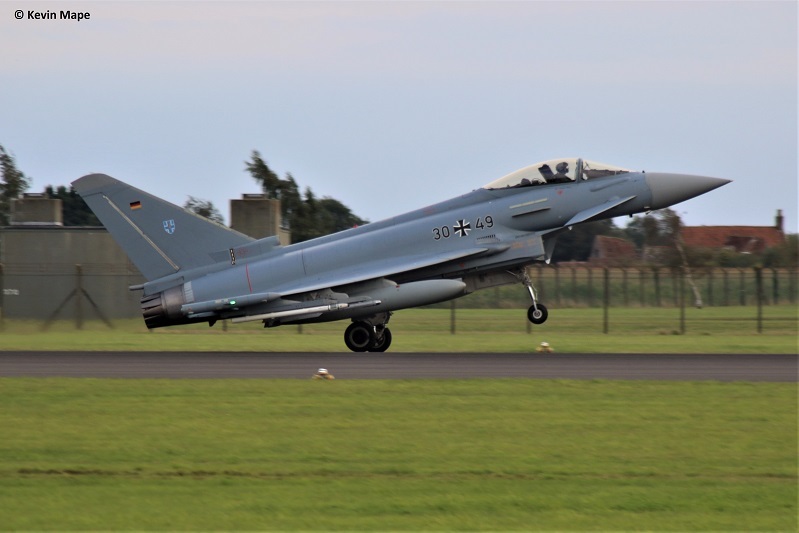 46+45/TLG51/Tornado ECRÂ c/s “GAF M 53” – Returned to Germany.